No one knows Spiney's name but anyone who has played Super Mario will be able to say "Oh! 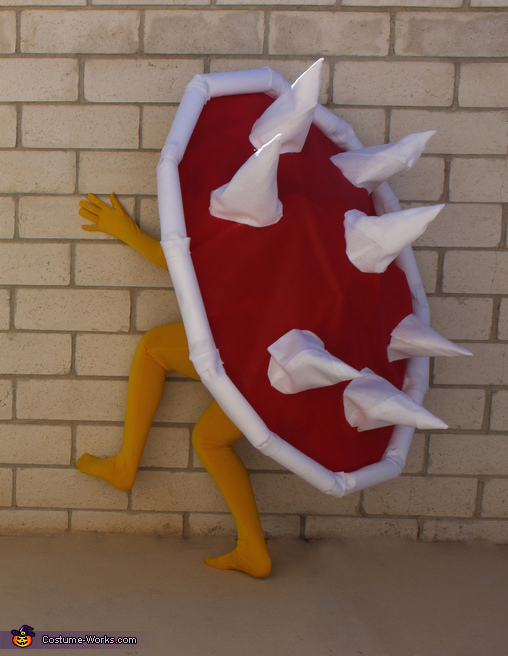 You're that spikey shell thing that climbs the walls!" And, yes, that was my costume. It is made of Amazon boxes glued together to form the shell shape, which I made the correct size for the character but it was hilariously unwieldy in real life. Many-a-car-side-mirror was bonked during Trick or Treating (and also many-a-shorter-child). The white edge of the shell is felt with paper inside to hold the shape. The red is fabric I got at Wal-Mart (after waiting an eternity for someone to come cut it for me - I could do it myself but I don't have the bar code printer). The spikes are felt with a single piece of cardboard precariously holding them upright. I bought one of those yellow body suits for the body – it was cold (and those body suits are tight) so I also had a yellow shirt for the under-shell. They tell you that you can drink through that suit but they don't tell you that you can't use a smart phone through those gloves. And you can't take those gloves off without quite a bit of trouble (especially while trapped in an hilariously unwieldy shell). The whole thing cost about $35 but mostly because of the yellow body suit. And maybe another $2 in glue sticks to keep the whole thing together but I already had those. In summary, I couldn't sit down or use a phone and no one really knew the name of my character but I was the best darn Spiney I've ever seen in my life. I dare you to say different! Happy Halloween!